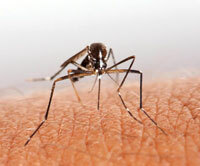 MALARIA claims over a million lives each year. Primaquine is the key drug for the eradication of the devastating disease. However, the drug can cause severe complications in patients lacking glucose-6-phosphate dehydrogenase (G6PD) enzyme. A study published in PLOS Medicine on November 13 has found that over 450 million people across the globe are deficient in this enzyme. One of the researchers, Rosalind Howes, a scientist at the department of zoology at Oxford University, says an understanding of the distribution and prevalence of G6PD deficiency can provide substantial information for designing and implementing safer malaria treatment practices across the globe. The enzyme is produced by red blood corpuscles and shields these cells against harmful by-products of certain medicines. Some people, however, suffer from a genetic disorder in which their body does not produce adequate amounts of this enzyme. Such people show a severe reaction to primaquine; the drug can make their red blood corpuscles burst and cause deficiency of blood and oxygen in their body leading to haemolytic anaemia and renal failure. For the study, the international team of researchers collected data from published academic literature, national screening programmes and random community surveys. They found sub-Saharan Africa has the highest frequency of such cases and the Americas have the lowest. However, Asia, due to its high population density, has the highest number of people with G6PD deficiency and almost 65% of individuals deficient in this enzyme are from Asia. Despite this, the paper stresses on the urgent need for diagnostic test for G6PD deficiency to make malaria-eradication strategies successful. “Lots of clinical studies are needed to establish safer ways of administering primaquine and its successor Tafenoquine, which is also risky for G6PD-deficient patients,” says Susan Tonascia, senior scientist at the department of epidemiology at Johns Hopkins Bloomberg School of Public Health.